Recently it seems the standard Green Bean Casserole is falling out of favor with a lot of families for holiday meals. There have been considerably more hits on this particular recipe in the holiday months than ever before, climbing to more than 700 views on Thanksgiving Eve in 2018. I hope you enjoy its wonderful simplicity as much as we do. We also now have a similar recipe available beginning in late 2018, Crock Pot Cream Corn, which is also great for holidays. Check it out! 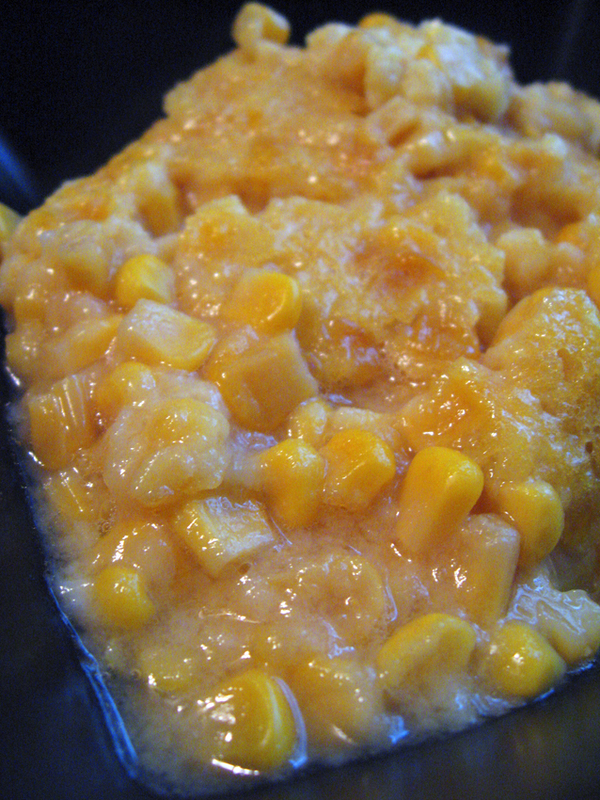 One of my favorite recipes of all time is that of Kentucky Sweet Corn Pudding, which comes from Mary Juett Pochodzay. Mary Juett and her family have lived east of the Kentucky Derby since before I met them over 20 years ago. She and her husband worked in the same school system for many years. Mary Juett was head of the cafeteria system there, and was so well-respected within Kentucky’s cafeteria community she ended up elected President of the statewide Kentucky School Food Service Association. There was a day in 1996 when I ate lunch in the school cafeteria that was under Mary Juett’s supervision. There were big, thick slices of baked ham with pineapple, a pile of black beans, warm and tender apple crisp … Real food prepared well. I’d never had a school lunch like that one the whole time I was in school. Mary Juett learned early-on how much I liked her version of Kentucky Sweet Corn Pudding, and had finally given me the recipe. I made it quite a few times over the passing years. So here it is, one of my long-time faves. I hope you like it as much as I have over many servings. Click on the above image for a larger version. Preheat an oven to 400 degrees F. In a medium mixing bowl beat the eggs, then add the flour, sugar and salt, mixing well. Fold in the corn and melted butter. Pour the mixture into an 8″ x 8 glass” casserole dish or tall 8″ ramekin. Without stirring further, bake at 400 degrees F for 30 – 40 minutes until the top is browned. Remove the finished pudding from the oven and allow it to set for a few minutes before serving. Add a few small (1/4″ square) blocks of butter to the top of the pudding before baking to improve browning if desired. The whole kernel corn can certainly be replaced with newer products containing chopped bell peppers and other additions. Other additions can also be made such as chopped or sliced jalapeno, chopped green onion, or even chunks of cooked bacon or ham. Use your imagination! Drool. I’m going back to school! 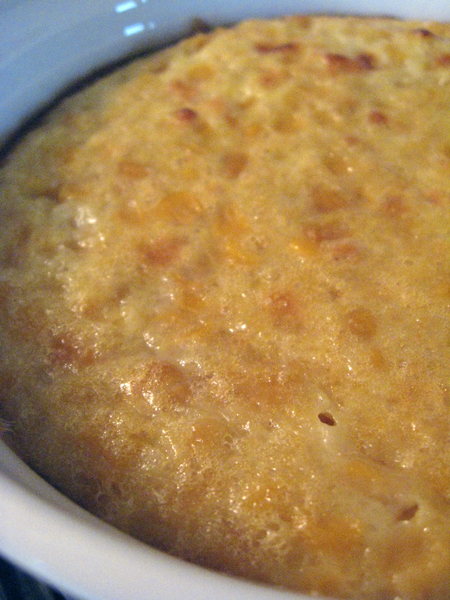 This corn pudding is heavenly!!! We had it last night with grilled ribs and baked potates…yum. I love summer cooking. The corn pudding was excellent. This looks and sounds SO good, I’ve just got to try this. Made this last night for a church event. Brought my pan home empty! By the way I am from Kentucky but now live in Maryland. Do you have the recipe for chess pie or butermilk pie? delicious!! I added a drop of vanilla extract. Dave – I come back to this recipe twice a year! Version I have has no eggs in it but a 8oz container of sour cream instead then melt a stick of butter to pour over top of casserole before baking it.